Do you know about bacon rolls? They are delicious little nuggets of bread dough stuffed with a sweet onion and bacon mixture. My sister Laurie’s mother-in-law, Aina Rans, immigrated to Canada from Latvia after WWII and along with her many talents she brought this recipe with her. Indian naan, chapati, roti, puri, paratha and parotta; Italian Focaccia and pizza, Greek pita; Egyptian balady, Armenian Lavash, Turkish bazlama, Mexican tortillas, Ethiopian injera; cuisines the world over have a flatbread. Some are leavened and some not. Most are circular and flat and typically made of a combination of flour and water. They are used as an eating utensil or plate, for sopping up gravy, dipping in olive oil, as a medium for toppings or stuffings, or for just enjoying with cold creamy butter. They are all delicious and I am sad for people who cannot for whatever reason enjoy them. I had not heard of a Swedish flatbread until I met my husband and got to try his grandmother’s fabulous bread recipe. Her name was Esther Ingejerd (nee Swenson) Anderson Richtik. She was twice widowed but with the help of her mother raised two children on her own on the windswept marshy tundra that is Northern Manitoba, Canada. 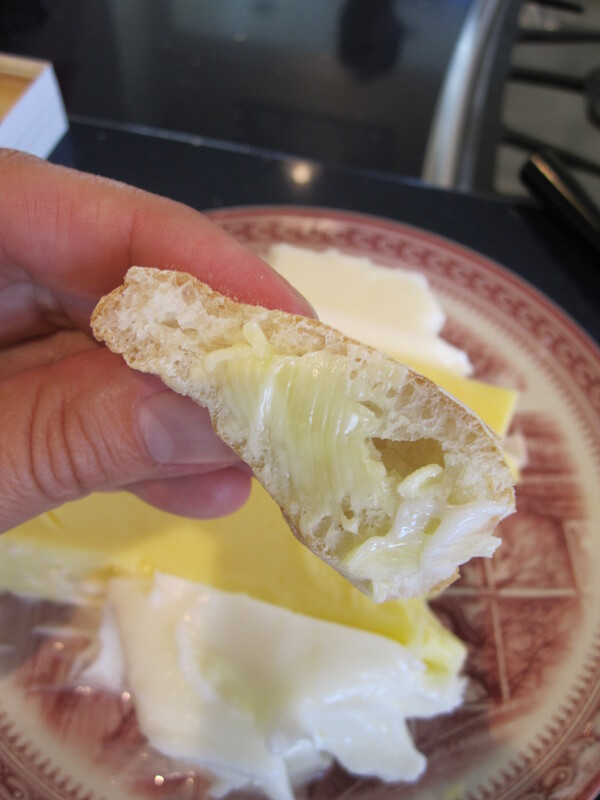 It was a harsh life but this bread which she called “Hulvchuck” (thanks to a reader of this blog I found out it’s spelled Halvtjock) was a comfort food for her family and she made bread a few times a week her whole life. Time with friends is a treasure. Time with friends who are ordinarily busy with very demanding careers and who have very little downtime is like finding the pot of gold at the end of the rainbow. This analogy seems completely apt in the case of me getting to spend time with my dear friend Donna McElligott. Donna has worked for the CBC for almost 30 years, travelled to all seven continents, lived in Moscow, Beijing, Inuvik and served as a parliamentary correspondent in Ottawa. I’m getting to spend more time with my friend this year because she’s on sabbatical from her post as host of Alberta at Noon. She’s taking time with her family and most of all, time with her octogenarian mother, Mrs. Sheila McElligott. Enter Irish Soda Bread. 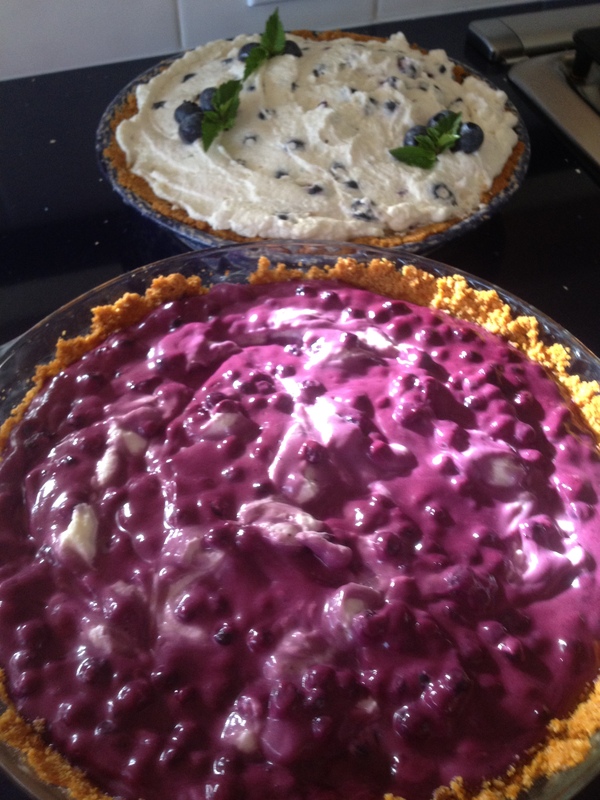 This short blog post is for those of you who’ve graduated from the Pie Crust 101 with my Mom as your Mentor entry I posted yesterday. This post has the “companion video” which illustrates a lot of the techniques that are crucial to turning out a flakey pie crust. 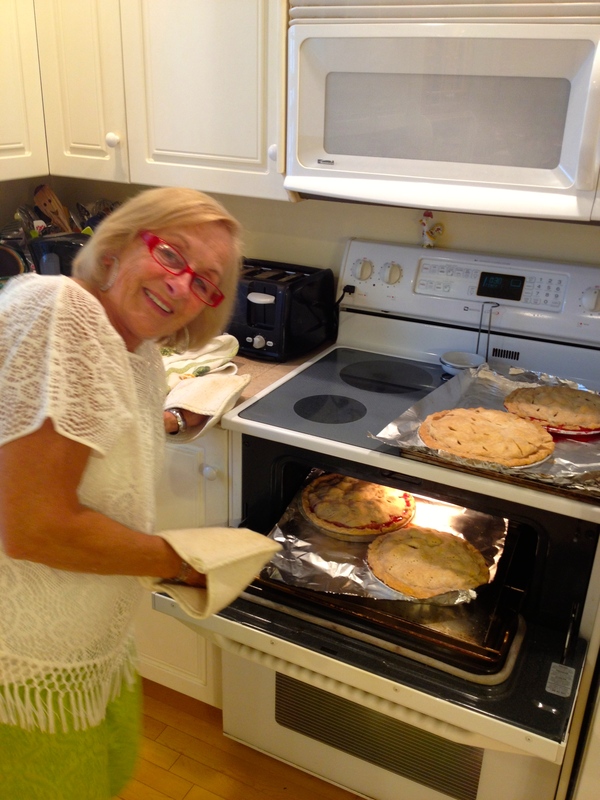 You’ll see my Mom, Gerri Robicheau, doing her thing which is making incredible pie crust. She does it without even thinking so I ask her lots of questions and try to get her to slow down and explain what she’s doing. I hope this helps you in your quest to be a great pie maker. Everyone should have a friend like my friend Marianne. I ran into her at the coffee shop and told her I was going home to “do my tomatoes”. She asked if “the job” could wait a day because she’d be able to help if it could. You already know the answer to that question. I won’t trifle with your intelligence. When someone offers to help you with canning there is only one answer. The next morning saw sun beams bathing my kitchen and friendship warming my heart as Marianne arrived and we began. She told me straight away she was impressed with the quality of my 25lb box of Roma Tomatoes. 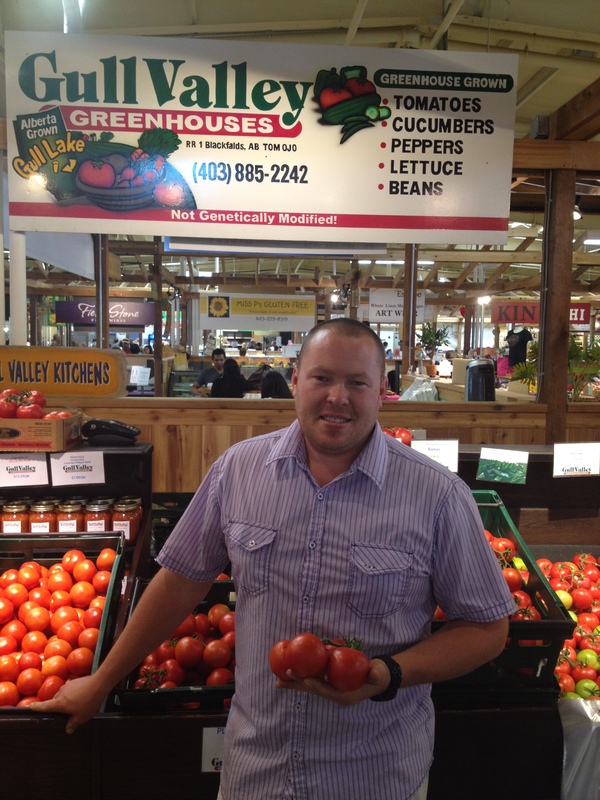 I got them from my friend, Scott Epple of www.gullvalley.ca at www.calgaryfarmersmarket.ca They are picked, put in a crate and not touched again until the consumer touches them at the market. I like a non-molested tomato. 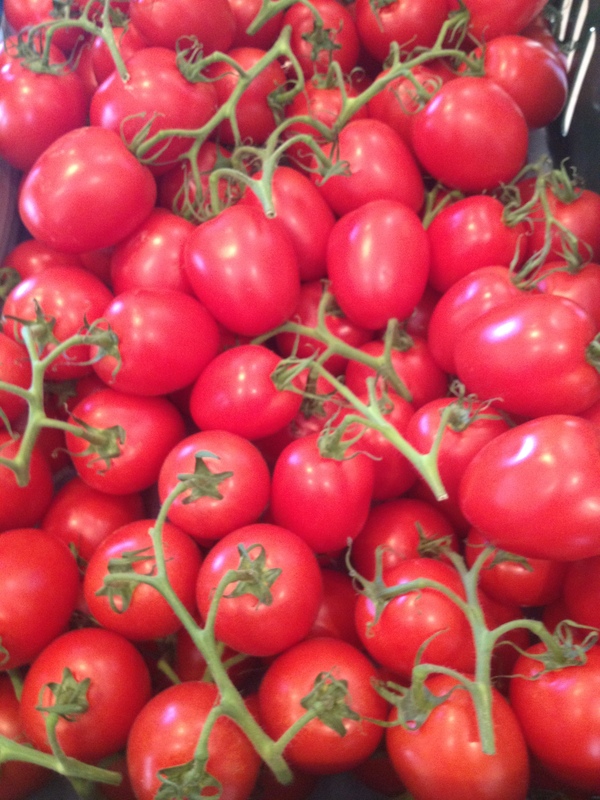 They are also grown without the use of pesticides or herbicides. It’s nice to start with that kind of quality and because they were completely vine-ripened they even smelled like a tomato should if it could. 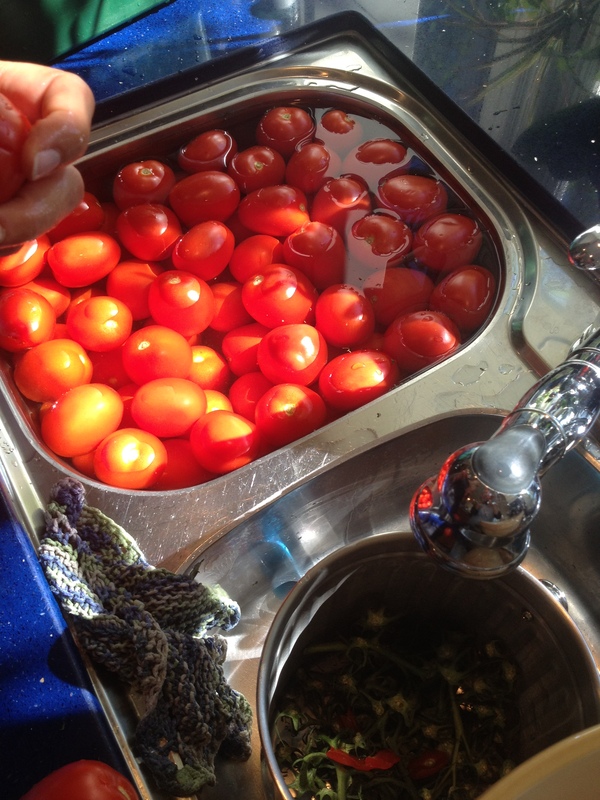 The first thing we did was wash all the tomatoes and then we cut the tops off and slit an X in their bottoms. 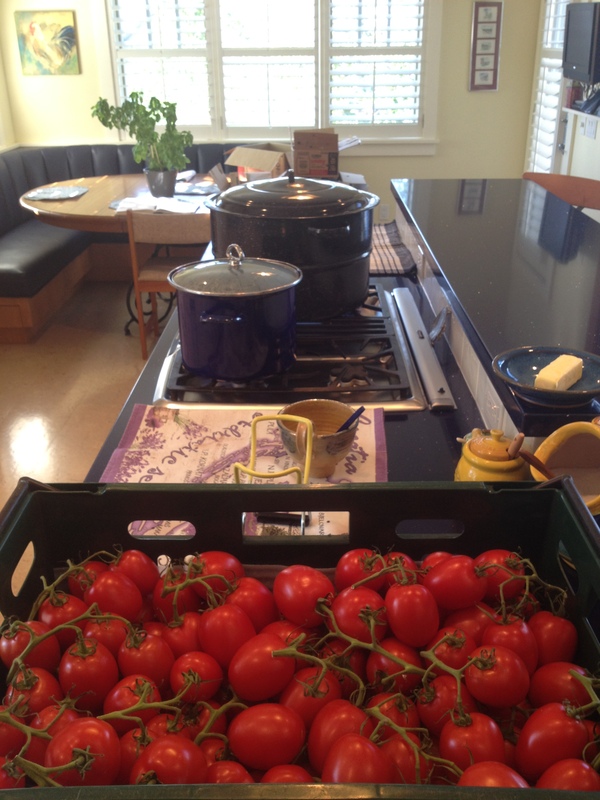 We then blanched the tomatoes by transferring them in bunches to a pot of boiling water for about 1 – 2 minutes. When the skins looked loose we lifted them with a slotted spoon into a transfer bowl and then plunged the works into another bowl of iced water. 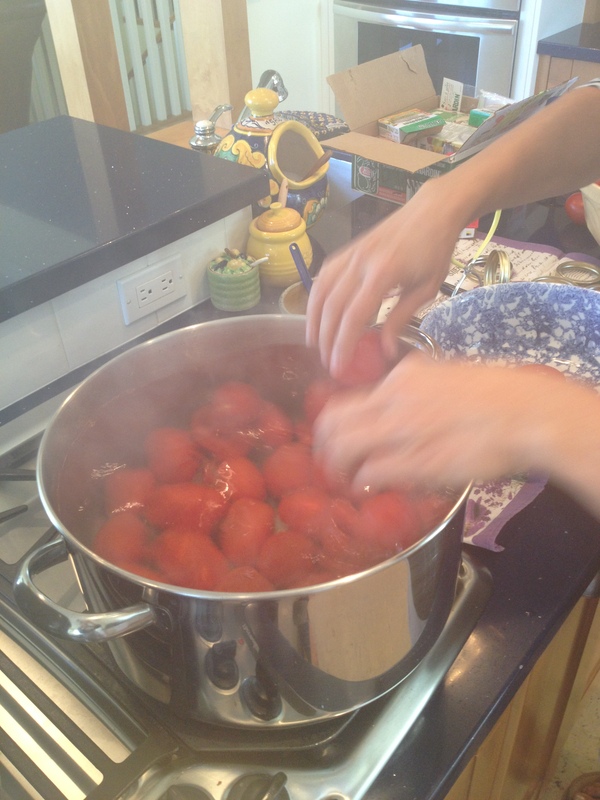 We removed all the skins with ease after the ice bath and put the skinned tomatoes into another big bowl. 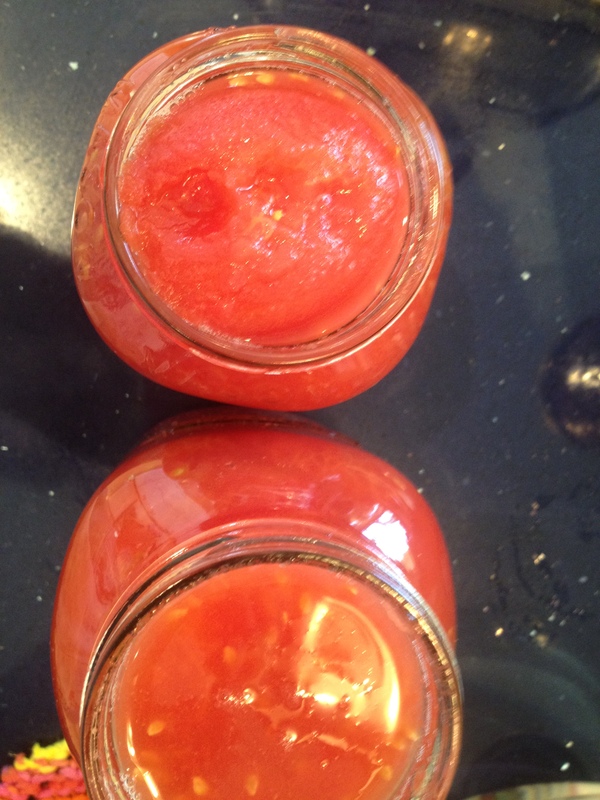 We were now ready to fill sterilized jars with tomatoes. 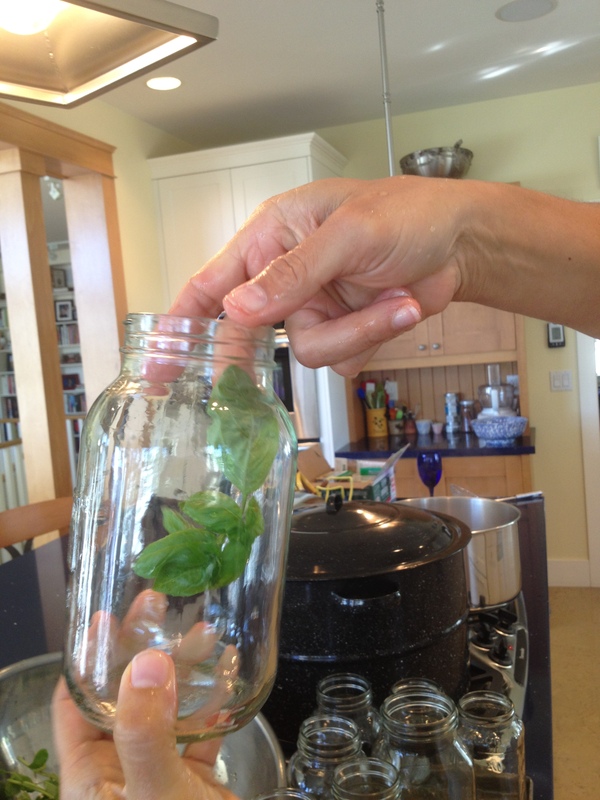 Hint: one of Marianne’s family secrets is to add a freshly washed piece of basil to each jar for extra flavour and visual appeal. 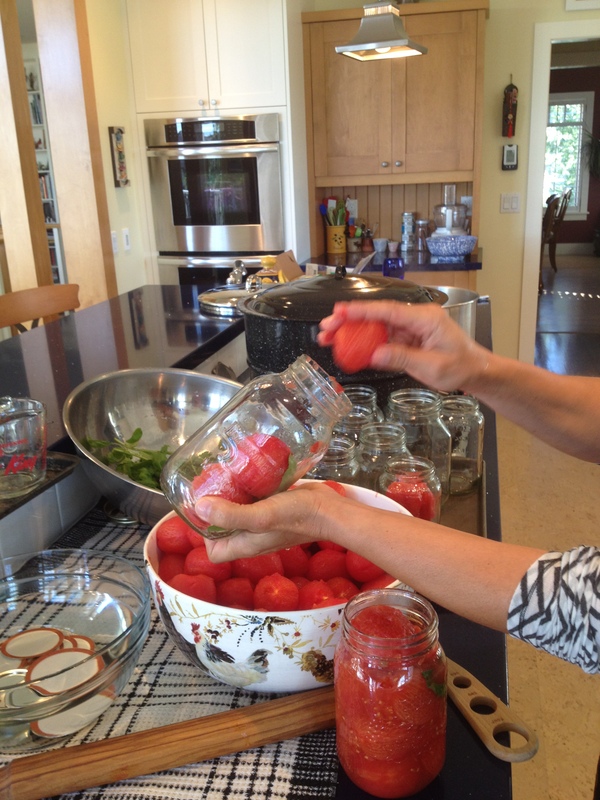 As we filled the jars, we occasionally plunged a metal knife into the tomatoes to remove air pockets and squish as many tomatoes into the jar as possible. Once we had all the jars stuffed, it was time to wipe the the lip of the jars and add the sealer lids and screw the rings on. 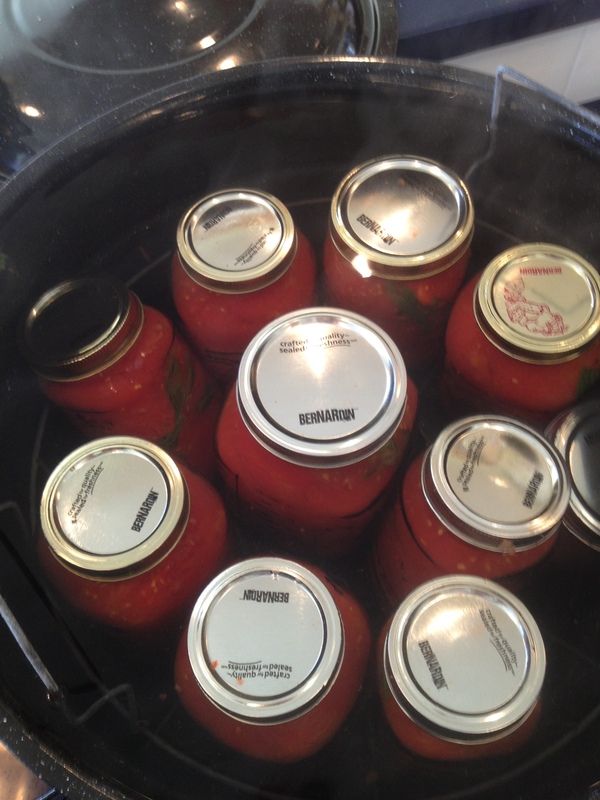 We then lowered the jars into the canning bath. It held the dozen jars my 25lbs ended up producing. We let the water come back to a boil and then set the timer for 20 minutes. 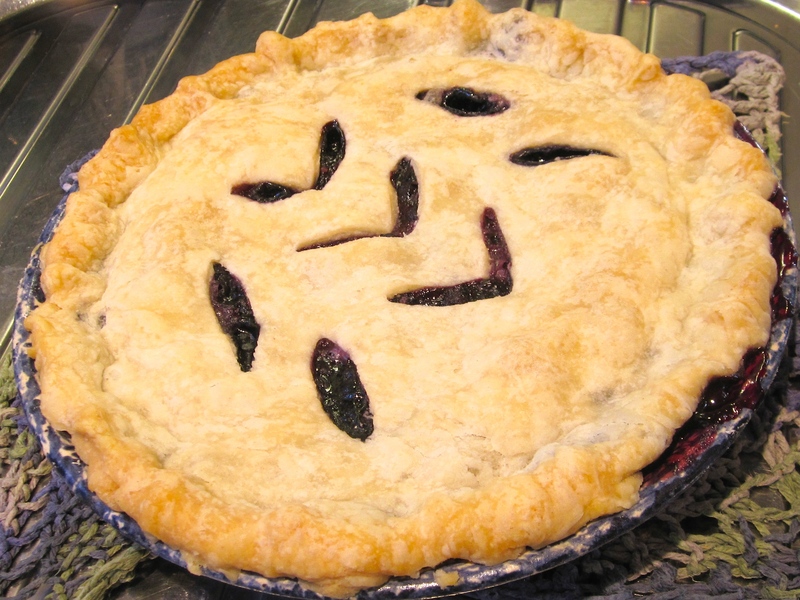 While the tomatoes boiled away we sat and had a few slices of some late summer blueberry pie recipes I’d been working on with a satisfying cuppa tea. Marianne asked how I felt about the work we had done together in a little over an hour. I said it was completely uplifting. She said, her only suggestion to me would be that if I was going to bring in the Italian muscle for a job, I should consider greatly increasing the number of tomatoes we would work on. She told me that she was used to doing 200 – 1000 lbs when her family got together to do theirs. I should maybe aim for 100 lbs next year and she’d still be happy to come and help me. Now that is a dear friend. 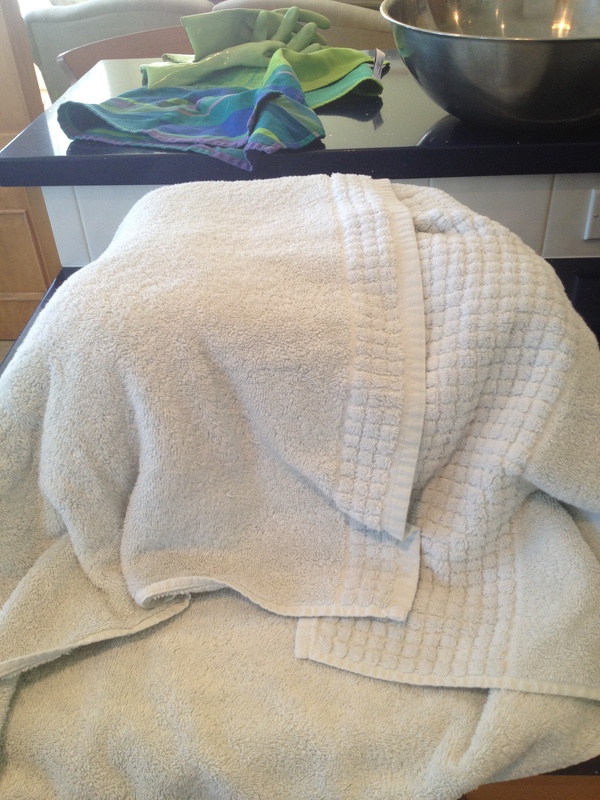 When the timer went, we turned off the stove and lifted the jars onto the counter covered in two thick towels. We turned the jars upside down and wrapped them snuggly in the towels. 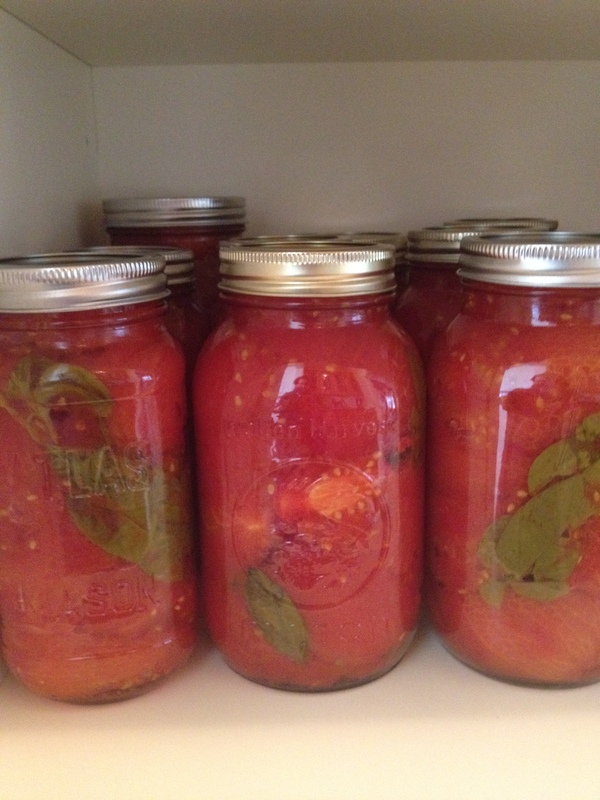 Marianne told me that her Mom and Aunt taught her to do this because they believe that by cooling the jars more slowly, the tomatoes have a greater chance of sealing properly. 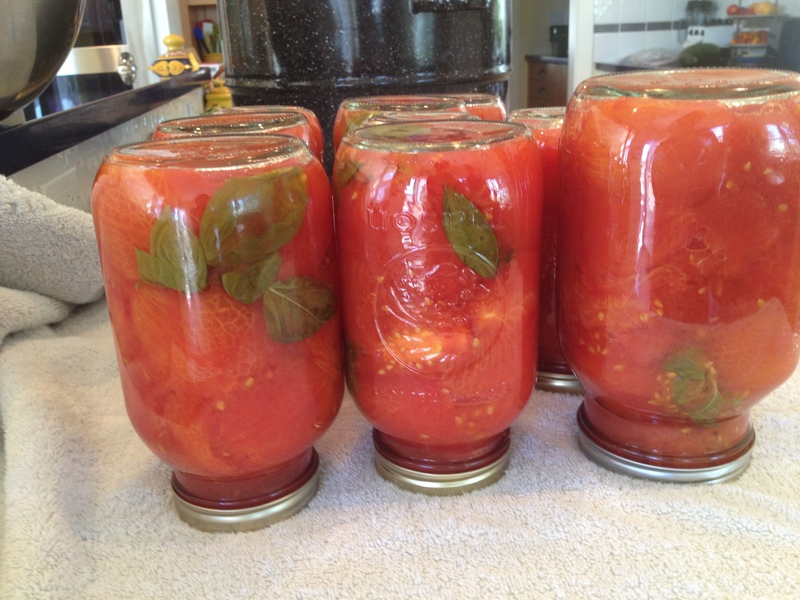 I don’t know if that’s true or not but the next morning I awoke to a dozen perfectly sealed jars. 1.Clean everything all at once, cut everything all at once, blanch everything all at once, stuff all the jars all at once and put them all in the processor at once. Other years I was blanching before I was done with cutting and then I was starting to stuff jars before I was done all the blanching. 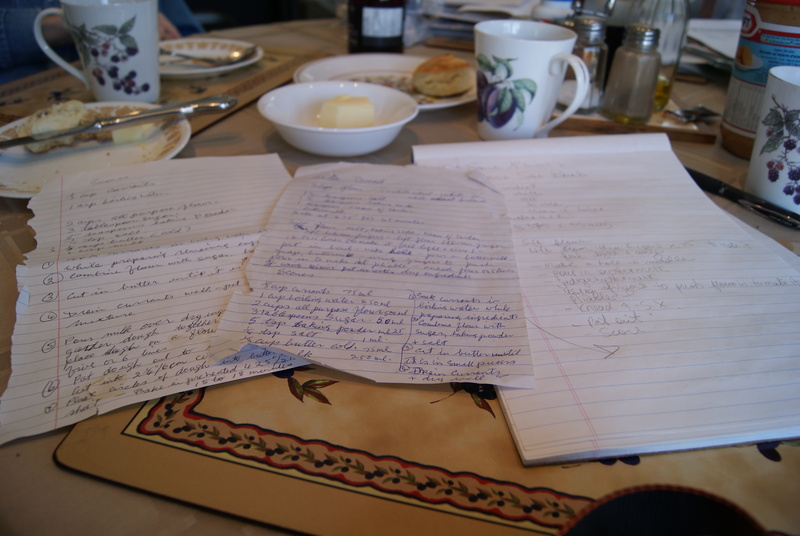 Everything felt so much more organized with Marianne’s step-by-full step approach. 2. Put your jars upside down and wrap them in towels so they cool slowly. 3. Marianne’s family never adds ascorbic acid. She says the tomatoes are acidic enough. 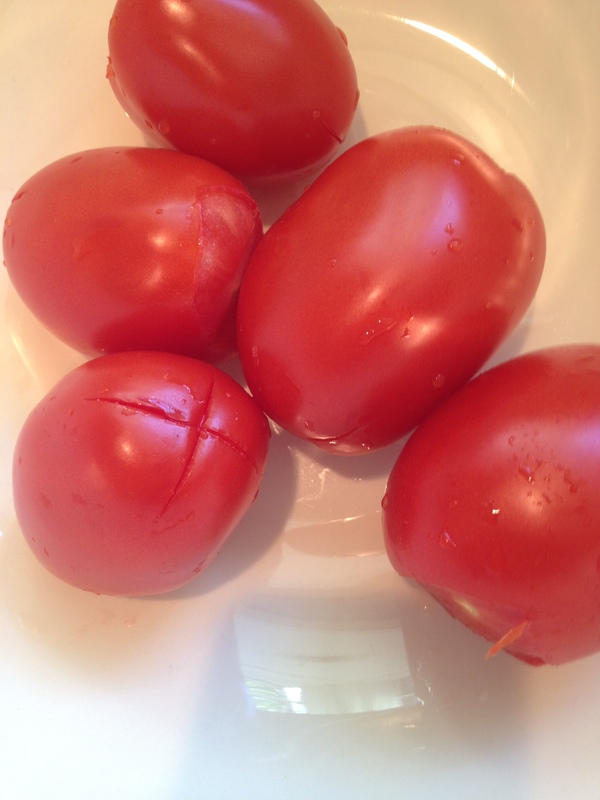 I found the tomatoes kept their brilliant colour this way where they had faded with the ascorbic acid I had used in other years. 4. Adding a piece of fresh basil is beautiful and flavourful. 5. I can’t go back!!! 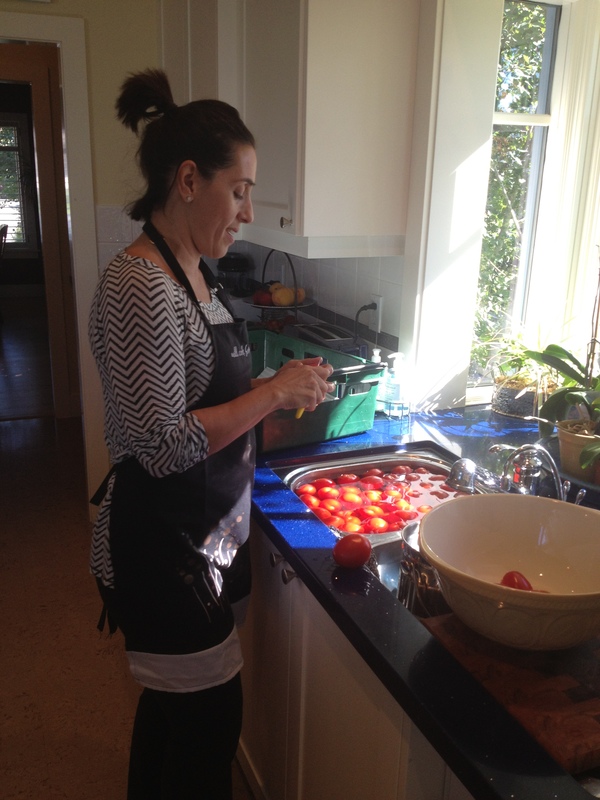 I hope my bella Italiana friend knows she has signed an implied bloody tomato oath to help me each year. 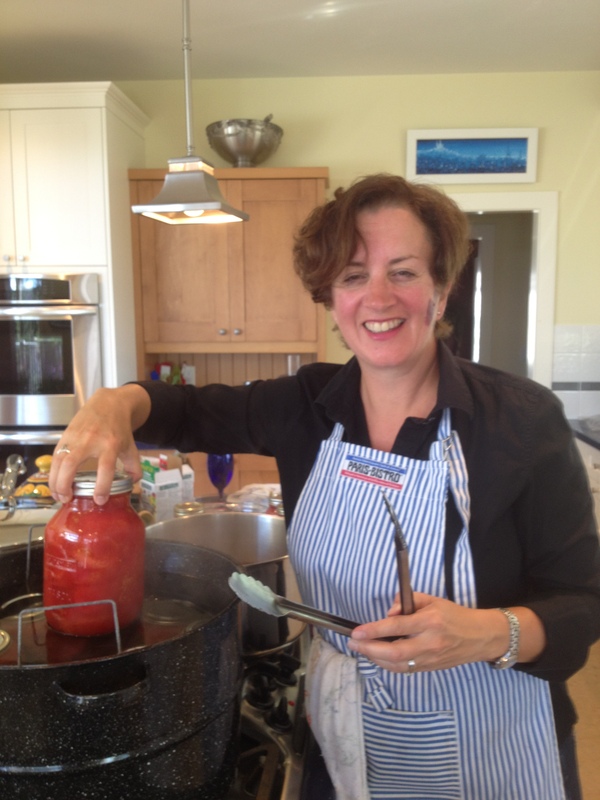 Even though she comes from a long line of incredible Italian cooks (both her Mom, Teresa’s, and her Auntie Cathy’s recipes form the backbone of recipes used in several of Calgary’s best Italian restaurants) I will love to think of a way to repay my generous friend. She loves my Indian cooking so maybe next year we’ll add a few Indian chutneys to our canning day. Going forward I’d like to think that friends that can together stay together and in this case tomatoes on the vine are the ties that have bound us as friends for life.